A 5 day photo workshop May 26-30, 2014 for 6-9 participants in the beautiful Dolomites mountains in Italy in the spring in the mountains. This is one of the most beautiful areas in Europe. 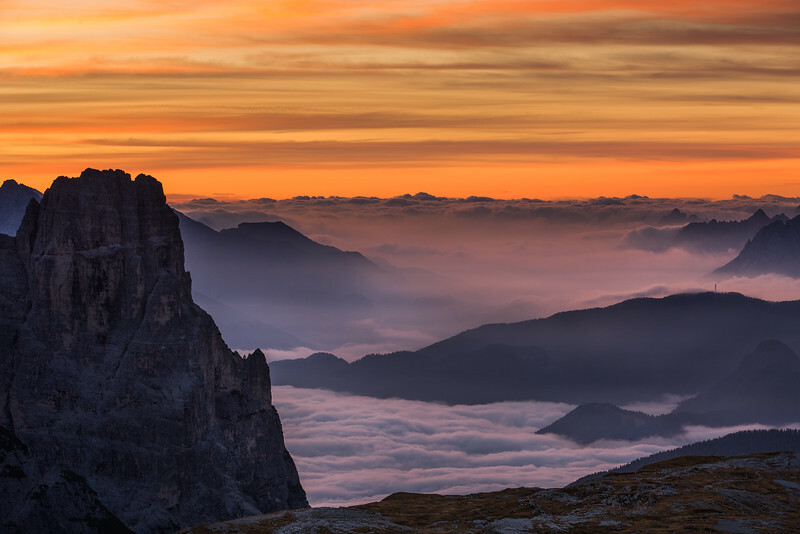 The Dolomites are known for their dramatic shapes and altitudes and is a wonderland for photography well. 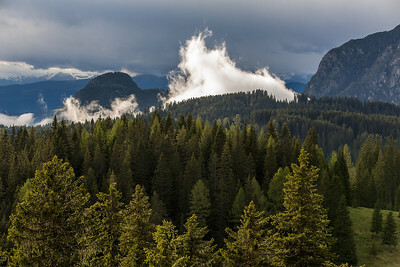 The weather can be dramatic at times and give wonderful opportunites for extraordinary pictures. The rugged rocks are also beautiful and are emphasized in many different shapes and forms, when the light creates shadows and colors in the morning and late afternoon. 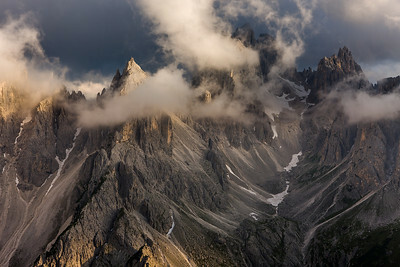 The location for this workshop is in the Eastern part of the Dolomites around Cortina d'Amprezzo and we stay in a hotel just outside of Cortina with good access to the interesting spots. 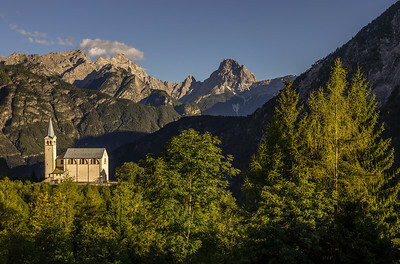 The other workshops in the Dolomites are located in the Western part around Lago di Carezza (the hotel is in Nova Levante). Notice that the flexible 5-7 day workshop program will be continued in 2014. The workshop is aimed at giving the workshop participant the opportunity to visit one of the most beautiful areas of Europe and get some great pictures. You can find examples of pictures from the workshop location and time of year in the gallery below. Scroll down to see the pictures. The instructor is Hans Kruse, owner of HansKrusePhotography. He is very experienced in landscape photography and in post processing techniques. 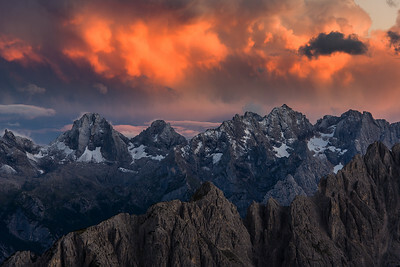 More of Hans Kruse's landscape photography work can be found here. * lectures about composition, scene selection, post processing, etc. * Morning shoot at sunrise (around 5:30) on a location and a drive through the area with stops at interesting locations. We will start early from the hotel between 4 and 4:30 to catch the beautiful twilight and have breakfast when returning around 9:00-9:30. * Breakfast and time to rest after. * Meeting room where there will be class room sessions with critique sessions, lectures on composition and post processing, etc. and a light lunch. Although it is a tight schedule we will try to have about 4 hours in the class room for 3 days and split over the day due to late sunset at this time of the year. The class room sessions will contain 2 days with critique sessions on the third and fourth day of the workshop such that there is time to take pictures for critique and then take new pictures based on the critique and enter the best into the last critique session. In the class room there will be time for post processing and ad hoc presentations based on need by the participants, e.g. a 1-2 hour walk through of Lightroom post processing features. Color management and workflow are other topics. The second day in the class room will be dedicated to a presentation on composition and how to select interesting view points as well as some post processing time and other presentations. * Dinner at the hotel at around 21:00-21:15. On the day of departure there will be a morning shoot followed by breakfast at the hotel and the workshop will end at 11:00. There are no specific expectations for the skill level of the participants to get full value from the workshop. You will likely have been interested in photography for some years and have acquired a digital SLR and a few lenses. However less experienced photographers are equally welcome and equipment does not need to be a digital SLR. The workshop will be adapted for the individuals attending such that individuals who need more guidance in certain areas will have the attention of the instructor to get help with the settings of the camera. For landscape photography in this area the focal lengths from 24mm to 200mm in 35mm full frame terms will be adequate (approx. 15mm to 135mm on crop DSLR cameras). A wider lens can be useful and a longer lens also (16mm and 300mm in 35mm full frame terms). It is expected that you are familiar with your camera including the most typical functions, however any question about camera operation and features are welcomed. Bring a manual for your camera too. A solid and stable tripod is recommended and a cable/remote release for your camera. Also it is expected that you are comfortable setting your camera on the tripod and adjusting compositions. The workshop is not aimed at giving beginners basic training course in handling the camera and tripod, although help and advice is given during the workshop to all participants on all aspects of landscape photography. The language of the workshop is English. The instructor uses Canon and Nikon cameras and have detailed knowledge of these cameras, however photographers with any camera are welcome. For post processing the instructor will use and show Adobe Lightroom and with additional processing in Adobe Photoshop. For HDR and tone mapping typically the Photomatix 32bit HDR plugin for Lightroom and with tone mapping in Lightroom is used. It is highly recommended that the participants bring their own laptop for post processing. For critique sessions you will need a laptop to process your own images. You are welcome to bring examples from your portfolio for critique sessions on your laptop or in print, however the focus will be on critique of images from the workshop. The temperature can fall to around the freezing point at this time of year in the morning, so please bring warm clothes and good, comfortable footwear for the time we will spend outdoors. Waterproof or almost waterproof and warm boots are highly recommended as grass is often wet in the morning and it is good to be able to walk into the landscape to find the best spots. In some locations longer walks up to 45 minutes can be expected, however not difficult or with high elevation change. The elevation will be up to 2400 meters. The cost of the workshop is 1195 Euro which include hotel, meals, beverages (breakfast, lunch time refreshments and evening dinner and drinks) and entrance fees for special locations. A single room for each participant (couples will be in double rooms). If you decide to come early you will pay these extra days directly to the hotel. Any extra shoots outside of the workshop is free of charge and is made as a service to the participants. The price does not include transport to and from the hotel (air fare, rental cars, etc.) and transport in the area. It is planned that the 6-9 participants and the instructor will drive in 2-3 cars for the shooting (the instructor in his car and 1-2 cars from the participants). To share a car e-mail addresses will be exchanged among the participants such that sharing of rental cars can be planned in advance. The distance from Milan airport (Malpenza) to the hotel (Hotel Argentina) located just outside of Cortina d'Amprezzo, is around 4.5 hours by car and alternatively the airport of Venezia about 2 hours. A rental car no smaller than a Fiat Punto is assumed for 3 photographers per car including their equipment. The plan is that every day it is changed who is driving together in order to get the most value of discussions among the participants. The reason for not including transportation is that it would add substantial extra cost to the workshop to include this and most participants would likely combine a workshop with a stay in the area. The hotel have conference facilities for class room sessions. If you would like to bring a spouse or friend to the workshop, then please indicate this in the registration e-mail and we will try to accommodate such requests on a space available basis. A spouse or friend cannot participate in any of the workshop activities. A GPS unit is highly recommended and mobile phones to get reconnected, if getting lost. The instructor will have a mobile phone operational at all times and walkie talkies in the cars. Please book space on the workshop by sending an e-mail to Hans Kruse at hans@hanskruse.com or if you would like to ask additional questions about the workshop. If you are not able to join this workshop or it is sold out, then please consult the workshop schedule or contact Hans Kruse. As the time of the workshop approaches (1-2 weeks in advance) you will get updates on the detailed schedule and meeting times and additional relevant information. You are welcome to divide the payment of the 1195 Euro into a deposit of 245 Euro at sign-up and payment of the 950 Euro April 1st, 2014. If the workshop needs to be cancelled a full refund will be paid. If you need to cancel participation the 245 Euros will not be refunded unless a replacement is found. If cancelled after April 1st a refund is only paid if a replacement is found.